What are some outdoor activities your children can plan with Dad? Consider the following ideas. 1. Camping – This is one great activity for children to enjoy with their fathers or other significant men in their lives. Does it mean you have to pack up a car, drive a long distance and find a secluded campground spot to enjoy camping? Absolutely not! If a long drive and spending a whole week camping isn’t possible, why not pitch a tent in the backyard? It isn’t important where you camp or for how long; what is important is that children and the significant men in their lives share some quality time together. 2. Fishing – What man doesn’t enjoy throwing a line in the water and seeing what he can catch? If the men in your children’s lives, or even some women, want to spend a quality day with the children, make plans to go fishing. You don’t have to pay a lot of money purchasing expensive fishing tackle. If money is an issue, you may be able to fish with a cane pole without a license and children do not require a fishing license. Of course, you will want to confirm your county or state fishing license. 3. Swimming – Perhaps fishing isn’t possible because the children are uncomfortable touching fish or worms. You can still enjoy a fun time near the water by heading to the local pool or lake where swimming is allowed. Be prepared with sunscreen to keep everyone from becoming sunburned. 4. Hiking – Hiking through the woods is a wonderful activity for dads and children to plan for during Father’s Day weekend or any other time during the summer. Find a local forest preserve with hiking trails. Pull together a backpack with snacks, water, sunscreen, a mini first aid kit, and jackets. Let someone know what your plans are and when you intend to return home. It would also be a good idea to charge your cell phone before you leave and to check in periodically. 5. Cooking out – You know Dad is the king of the grill! Celebrate by planning a cookout, and if he allows it, let him take the day off. Even if Dad does decide to man the barbecue, make sure to prepare everything else so you can enjoy a great meal once the food is ready. Summertime, or anytime really, is perfect for children to spend quality time with their dads or other significant men in their lives. 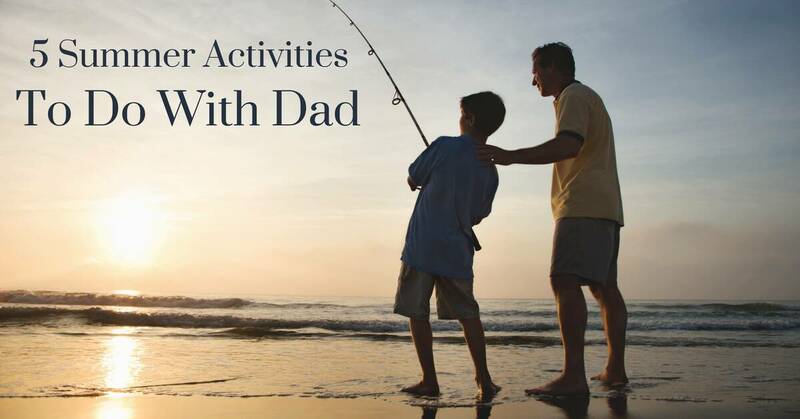 You can choose one or more of these outdoor activities during Father’s Day weekend or discover other adventures together that your family enjoys.